I’m really wishing I had my design wall when I started this quilt. I didn’t have anywhere big enough to lay it out and keep it laid out so I could better plan on where my stars were going to be, and make sure I had equal red and blue made into stars. 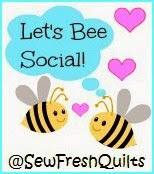 I started this last summer when Jenny from Missouri Star Quilt Company did a tutorial. I loved the idea of a patriotic quilt with using the white strips for the stars. But, I got frustrated and put it away. You can see where I left off sewing, just under the 5 stars. I like it!! It is a scrap quilt, and has a charm all it’s own! Go for it! 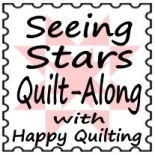 Hi, Dorothy – I love this quilt with its scrappy rails and the stars – it’s nice! Thank you, Lynette, it’s growing on me! I moved the bottom star a bit to the right which I think is helping. It will be a nice patriotic one when it’s done.